Blondie and Brownie: Celebrate Chocolate! 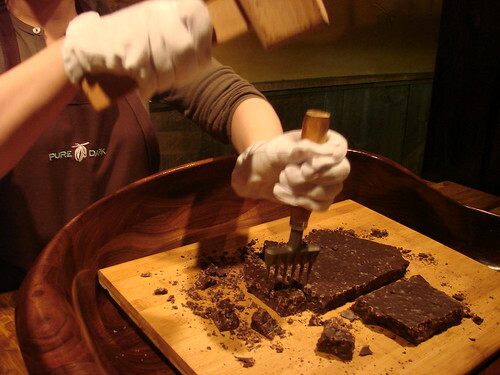 If you love sinfully dark chocolate you're sure to find a tasty treat at the newly opened Pure Dark in the village. 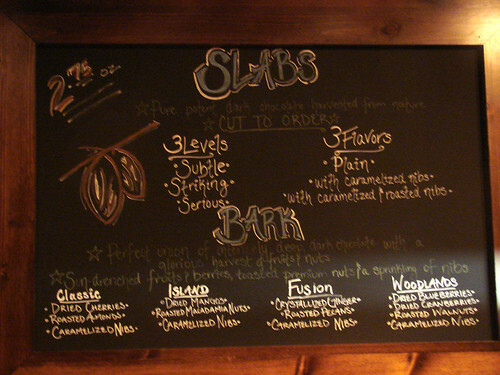 They sell chocolate hand cut from an enormous slab for $2.75 an ounce. Or you can make your own chocolate mix out of cacao nibs, dried fruits and nuts. I'm partial to plain fro-yo myself, but I have to say that the chocolate from Bloomies' Forty Carrots is pretty darn good. If you're lucky, they might have peanut butter as well. Mmm. 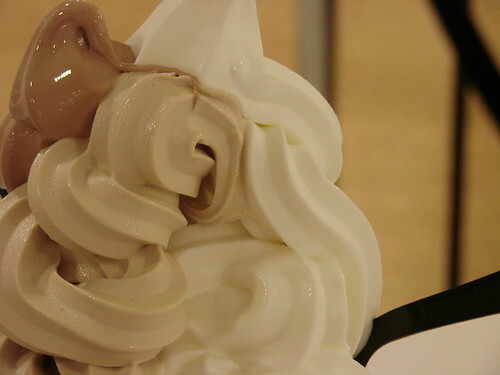 Fro-yo peanut butter cup. 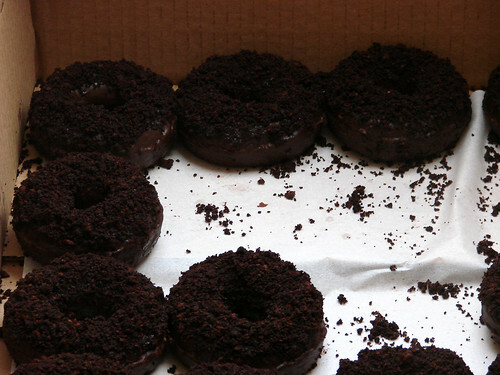 If you are looking for a killer chocolate doughnut look no further than the Doughnut Plant on the Lower East Side. Their Valrhona Chocolate Glazed Doughnut is to die for. At $2.25 to $3.00 per doughnut, these beauties don't come cheap, but they are well worth it. 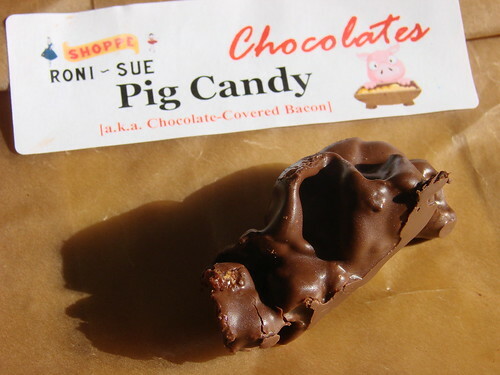 Chocolate + Bacon = AMAZING. And the best place to get it is definitely Roni Sue's in the Essex Market where Ms. Rhonda Kave deep fries her bacon reducing it down to crispy strips ready for dipping in milk or dark chocolate. $9.50 for a quarter pound it works out to about $1.25-$1.50 per choco covered bacon strip. Not too shabby or too pricy. 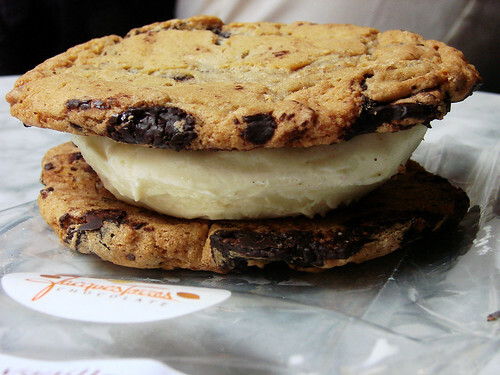 Rich, creamy ice cream sandwiched between buttery dark chocolate chip cookies. Need I say more? Oh, yeah, this huge chipwichesque treat will only set you back $5. The world needs more ice cream sodas. 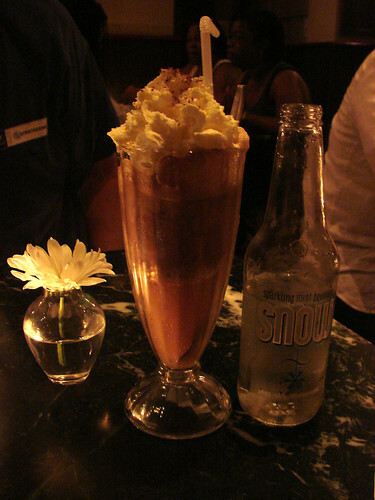 Thankfully the Chocolate Room in Park Slope is doing their part with the Snow Mint Chocolate Float, Natural Snow Mint Soda with a scoop of chocolate ice cream topped with fresh whipped cream. Yum. $7, a bit pricey but a nice way to cap off a good evening. I also highly recommend their chocolate fondue for 2 for $14. It features 60% Belgian chocolate with fresh fruit, pound cake, and homemade marshmallows. 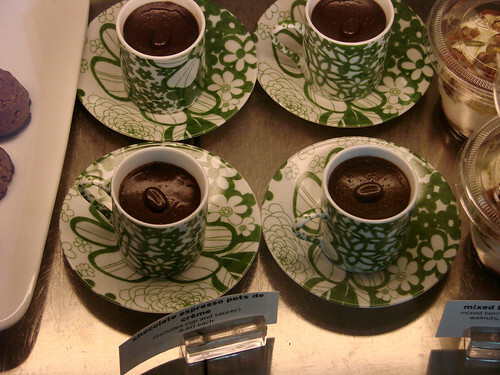 These espresso pots de creme from Three Tarts are tasty and functional; their $8.60 price tag buys you both the dessert and the ceramic cup and saucer. Perfect for a hostess gift or a romantic date night at home. Labels: "chocolate show" "new york" "chocolate"
Oh how I wish I was going to be on the east coast anytime soon! Thanks for the roundup! I love the idea of that Pig Candy. That is a PMS dream! !